This method can be applied by those who don’t have Aadhar number and fall in any of the below mentioned categories. Their taxable income is Rs. 5 lacs or less. They are not seeking any Income Tax Refund. If a person does not fall under any category mentioned above then he is not eligible for this type of verification i.e. to avail this facility a person must satisfy both the conditions. It is important to mention here that Aadhar card holders can also opt for this type of verification but even they have to satisfy at least one of the conditions mentioned above. Below are the steps given for electronic verification of e-filing using Electronic verification code (EVC) sent to registered mobile number & email address of the assessee. Step 2: Now, navigate to “e-file” menu and click on “Generate EVC” as shown in Figure 1 and 2. Once you will do this, you will get Electronic Verification code (EVC) at your registered mobile number & email. Step 3: Click on ‘e-Verify’ link to e-Verify the return (Figure 3). Now, the taxpayer will see three options as given in Figure 4 if he has already filed the return and the same has not been verified yet. 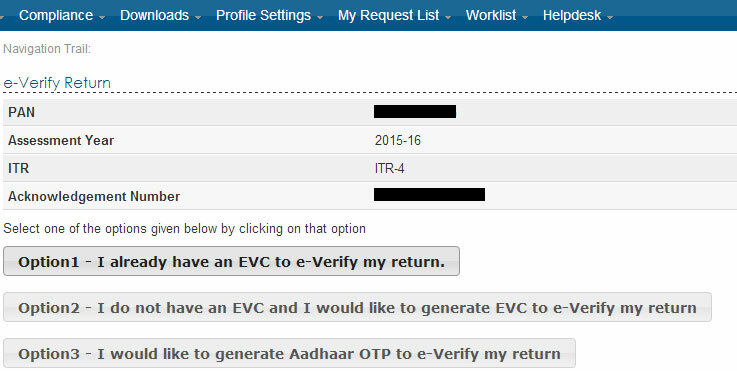 Step 4: Now, as you already have EVC so please click on “Option-1- I already have an EVC to e-Verify my return”. Step 5: Enter the EVC that you received on your mobile number and email ID in the provided text box and click “Submit” (Figure 5). A message will be displayed on the screen showing the successful e-verification as given in Figure 6 below. You can download the attachment which has also been sent to your registered email id and no further action is required. This completes the electronic verification of e-filing using Electronic verification code sent to registered Email ID and Mobile Number.